Senior Boxes are formally called the Commodity Supplemental Food Program (CSFP). CSFP is the only USDA nutrition program that provides monthly food assistance targeted at low‐income seniors. The program supplements seniors’ diets with a monthly package of nutritious USDA commodities. 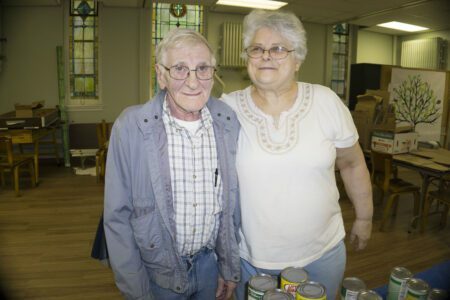 CSFP serves individuals aged 60 and over with incomes of less than 130 percent of the Federal Poverty Guideline—helping to prevent vulnerable seniors from having to choose between food and other basic needs. Included in the box you’ll find canned fruits and vegetables, peanut butter, beans, cereal, pasta, bottled juice, shelf-stable milk, canned meat, and 2 lbs of American cheese. The boxes are distributed though neighborhood sites, so contact us to find the site closest to you. Click here to view the CSFP flyer! Need assistance or interested in helping seniors receive a box each month at your organization? Please call 412-460-3663 Lydia at ext. 554 or Elizabeth at ext. 551. You can also email at lvanderhill@pittsburghfoodbank.org or edoyle@pittsburghfoodbank.org.